The Ale Pack is designed to bring more happiness to the daily lives of Dwarves. Because after all, what is a Dwarf without beer? The Ale Pack provides your settlement with the legendary Ale Tree and Mead Barrel. Never again will your Dwarves need to brave the deep underground with dry throats. The Ale Tree: A crop of Dwarven legend and proof of their ingenious idea of extracting ale directly from certain trees. Having a worker extract ale from the Ale Tree provides the settlement with Happiness. It can be found in the Special Crops category where it only waits to be built. The Mead Barrel: What is the second best thing after drinking mead? Having it stand around in barrels of course! Having a couple of Mead Barrels as decorations is a great way to increase your settlement’s happiness. 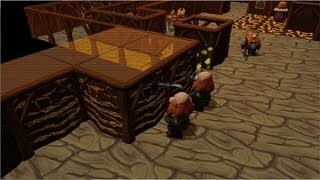 Build them from the Mixed Decorations category and give your Dwarves a proper living environment.